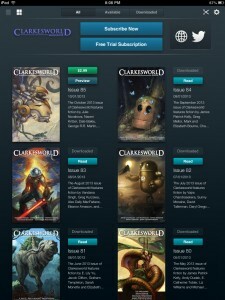 The Clarkesworld Magazine apps for iPad, iPhone, and Android devices launched yesterday! The app is free to download and from within, you can purchase individual issues or monthly subscriptions. If you don’t already have a subscription through Amazon or Weightless, I hope you’ll consider supporting us by choosing one of these alternatives. Download now from iTunes or Google Play. OK, why? I don’t want or need a separate app for each magazine. Just make the magazine available in the Kindle Store, Play Store, Zinio, etc. Making a separate app for each digital magazine makes about as much sense as a separate newsstand for each paper magazine. We are available in the Kindle store, but the others you mentioned won’t deal with smaller publishers like us. That leaves us with no choice but to go with apps if we want to be available on those platforms.